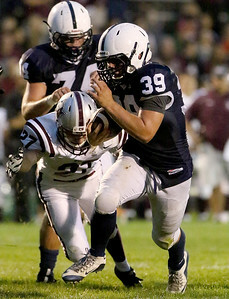 Matthew Apgar - mapgar@shawmedia.com Cary-Grove takes on Prairie Ridge during their season opening football game on Friday, August 28, 2015 at Cary-Grove High School in Cary. 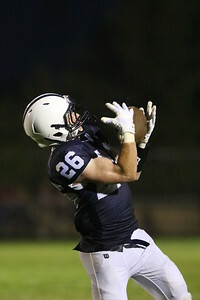 Matthew Apgar - mapgar@shawmedia.com Cary-Grove senior Maddie Cote performs with the color guard and poms squad during halftime of their season opening football game against Prairie Ridge on Friday, August 28, 2015 at Cary-Grove High School in Cary. 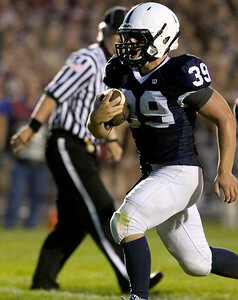 Matthew Apgar - mapgar@shawmedia.com Cary-Grove senior Carli Peterson, bottom, shakes her plastic, rock-filled jugs as the Trojans take the field against Prairie Ridge during their season opening football game on Friday, August 28, 2015 at Cary-Grove High School in Cary. 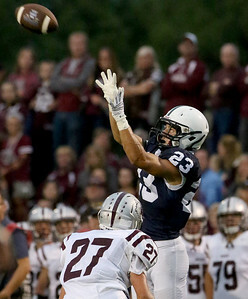 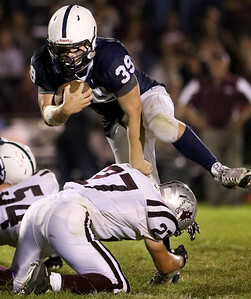 Matthew Apgar - mapgar@shawmedia.com Jimmy Freskos of Cary-Grove leaps up to make the catch over Nicholas Pilafas of Prairie Ridge during their season opening football game on Friday, August 28, 2015 at Cary-Grove High School in Cary. 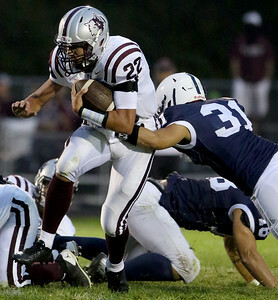 Matthew Apgar - mapgar@shawmedia.com Tyler Penninton of Cary-Grove plays leapfrog with Nicholas Pilafas of Prairie Ridge during their season opening football game on Friday, August 28, 2015 at Cary-Grove High School in Cary. 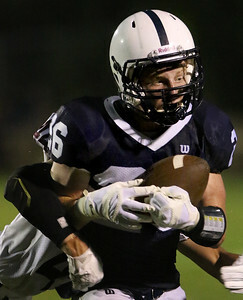 Cary-Grove won 21-14. 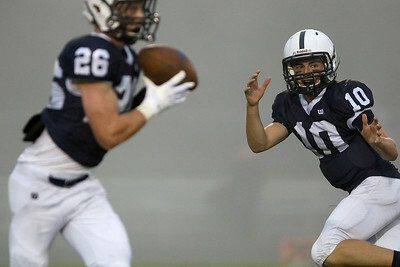 Matthew Apgar - mapgar@shawmedia.com Quarterback JP Sullivan of Cary-Grove, right, watches teammate Kevin Hughes run with the pitched ball against Prairie Ridge during their season opening football game on Friday, August 28, 2015 at Cary-Grove High School in Cary. 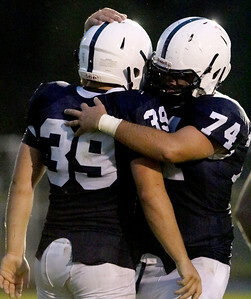 Matthew Apgar - mapgar@shawmedia.com Tyler Pennington of Cary-Grove, left, gets a hug from teammate Ross Bernier, right, after Pennington scored a touchdown against Prairie Ridge during their season opening football game on Friday, August 28, 2015 at Cary-Grove High School in Cary. 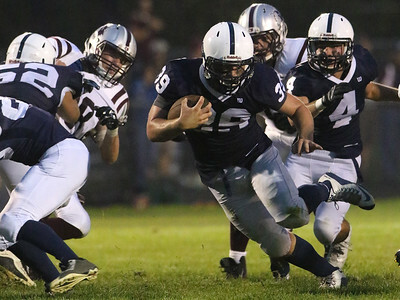 Matthew Apgar - mapgar@shawmedia.com Tyler Pennington of Cary-Grove runs downfield past a falling Nicholas Pilafas of Prairie Ridge during their season opening football game on Friday, August 28, 2015 at Cary-Grove High School in Cary. 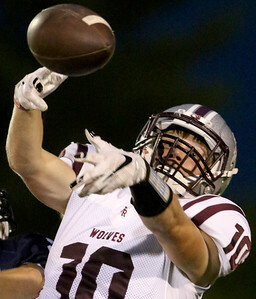 Matthew Apgar - mapgar@shawmedia.com Dean Brown of Prairie Ridge watches as the ball flies toward him during their season opening football game on Friday, August 28, 2015 at Cary-Grove High School in Cary. 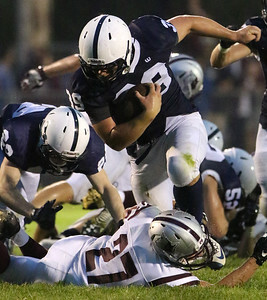 Matthew Apgar - mapgar@shawmedia.com Kevin Hughes of Cary-Grove, right, is taken down by Nicholas Greenberg of Prairie Ridge during their season opening football game on Friday, August 28, 2015 at Cary-Grove High School in Cary. 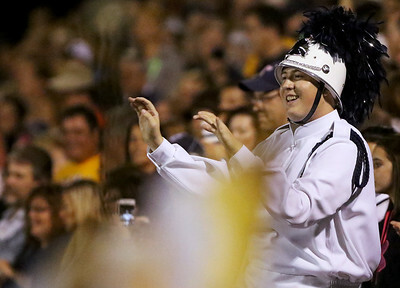 Matthew Apgar - mapgar@shawmedia.com Cary-Grove marching band drum major Jacob Limpus entertains the crowd while dancing in the stands as the band and color guard performs for fans during halftime of their season opening football game against Prairie Ridge on Friday, August 28, 2015 at Cary-Grove High School in Cary. 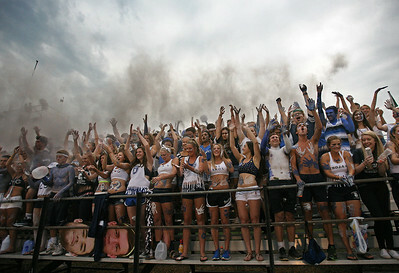 Matthew Apgar - mapgar@shawmedia.com Cary-Grove students throw handfuls of powder into the air as their Trojans take the field against Prairie Ridge during their season opening football game on Friday, August 28, 2015 at Cary-Grove High School in Cary. 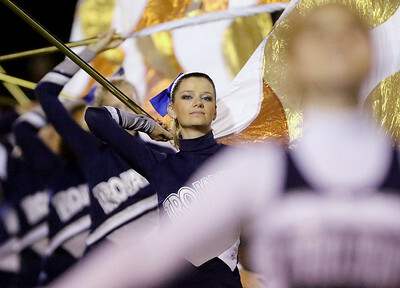 Cary-Grove senior Maddie Cote performs with the color guard and poms squad during halftime of their season opening football game against Prairie Ridge on Friday, August 28, 2015 at Cary-Grove High School in Cary.